A simulation of Bitcoin mining. Seamless continuous loop. As the world’s first and most valued crypto currency, Bitcoin seems an apt subject for computer simulation. Although Bitcoin is a virtual currency with no underlying asset, the resources required for its operation are substantial and growing. As with many technologies today, there is often little physical evidence of the significant work and energy consumption taking place in the back ground. For example, ‘Bitcoin mining’ (the process whereby huge numbers of computers in data centres are used to solve highly complex cryptographic puzzles so that transactions can be verified and new coins issued) is consuming an increasing share of the world’s electricity supply (estimated to equal that of the country of Denmark at the end of 2017) often with little consideration for the source of that energy aside from cost. 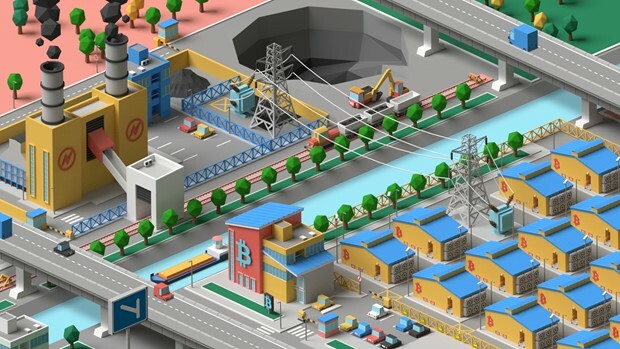 Many of the largest bitcoin mining facilities in China are linked to coal produced electricity. This animation replicates that infrastructure in a virtual world. 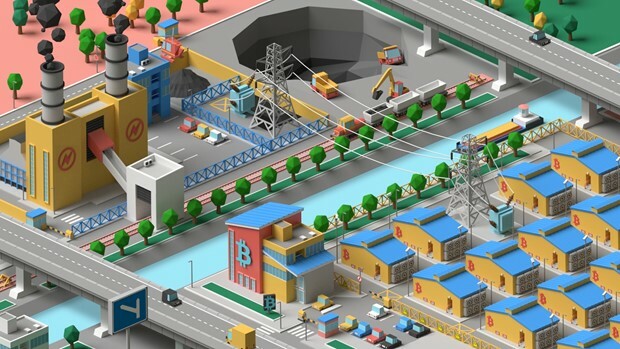 The animation was created using isometric graphics (regularly used in video games during the 1980s and 1990s such as Sim City) which provide a limited 3D effect while greatly reducing the computer render time and, hence, energy consumption, involved in creating the work. This seemed important given the subject matter.